Dutch vessel owner Chevalier Floatels owner of walk to work vessels and accommodation barges has fixed hotel vessel Rossini to Deme. 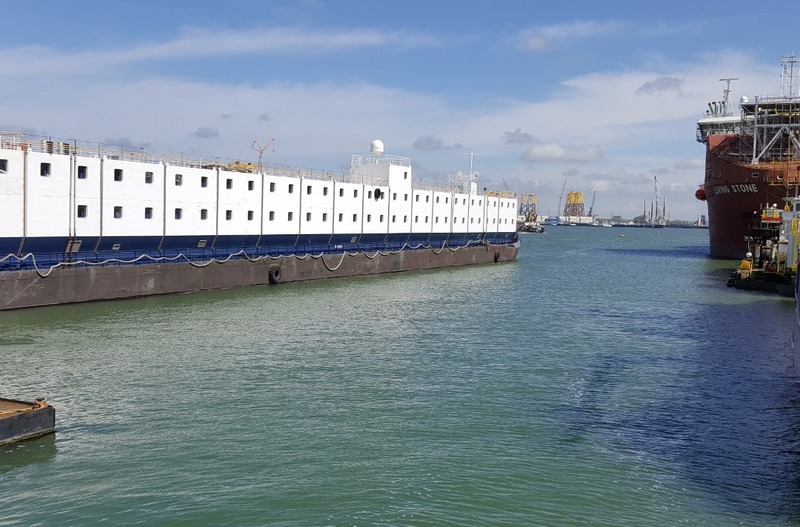 The vessel with 110 cabins and accommodation for 220 persons is being used to accommodate the persons installing the cable lay equipment on board the new build vessel Living Stone owned by Deme. The project has been quite a challenge for Chevalier Floatels. There was only a 2 week lead time to get the vessel prepared, stocked and on location in Vlissingen. However thanks to great team work of the Chevalier crew and the good cooperation with Deme the vessel ws ready on time to house and feed the employees on board the Rossini. The project is scheduled to last a few weeks. Deme will install a dual lane cable installation system on the Living Stone with a capacity of 10,000 tons. Having 2 systems will allow the vessel to install one cable, while fully preparing the second one on deck, minimizing the time to prepare the second cable. Once completed the vessel will leave for Hornsea Project One for its first cable laying assignment. Deme is an offshore contractor active in all sorts of marine and offshore solutions. It is also a large contractor in the offshore wind installation segment owning both installation vessels and cable installation vessels. Chevalier Floatels is a vessel owner and operator active with 4 accommodation barges and two offshore support vessels, DP Gezina and DP Galyna with Ampelmann gangways.